Observation the second: ArenaNet has made the look of Guild Wars 2 — especially its UI — so elegant and attractive that the competition looks downright shoddy in comparison. Observation the third: I think I’m going to like GW2’s character growth system, AKA “traits.” Not prepared to say LOVE it, but it got my attention. 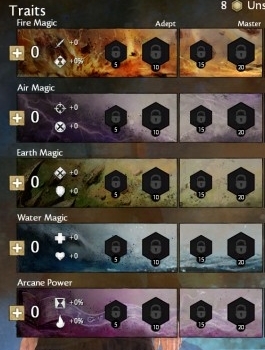 ArenaNet posted an overview of how you’ll be able to modify your character as he or she levels up. In a nutshell: Every level you get a point to spend in one of five trait lines for your class. Each point increases two stats for your class. Every fifth point unlocks a fixed, minor trait ability, and every tenth point gives you the choice of a major trait ability from a list. It’s not terribly complicated, which is good, and it’s not quite a talent tree, which is probably also good at this point. My initial impressions after looking at this was “Warhammer Online”, although EverQuest II’s AA system looked somewhat similar. But it’s definitely more focused with just a few juicy rewards instead of loads of modifying ones. Due to the number of points you’ll ultimately end up with, you’ll be able to max out two trait lines with some left over (or settle for a lesser amount across a greater range). This should be pretty familiar to Guild Wars 1 players, since you’d be able to max out two lines there per class as well. I can’t see spending gobs of time obsessing over the trait page, but it certainly opens up choice without seeming like it’s going to pigeonhole us into specific builds (although, give the community time on that, I know). I really do like that we’ll get to CHOOSE a major trait ability from a list versus just having one handed to us. Every ten levels promises to be a major event in your character’s life. Can this game come out already? I can make room in my gaming schedule, promise. One of the reasons that I’m happy to be an MMO gamer in 2012 versus an earlier era is that my time has become extremely precious to me, and happily, most MMOs have changed to accommodate shorter gaming sessions. It’s one way that MMOs have come into alignment with the rest of the video game industry, allowing us to play in both burst and marathon modes. So not only do I have less time these days (and, come this September, baby #3 will probably eat into that a little more), but I’m enraptured by a wide range of titles. The days of playing just one MMO are fading fast in the rearview mirror, and I’m constantly enticed by other titles when other players, bloggers, and friends talk about them. What to do? I’ve actually adapted something from my work day into my gaming day, which is to divide my time into 30-minute segments and allow those segments to structure my gaming time. I know that my personality is such that I can get sidetracked by a single project for a long time while ignoring others, so at work I start the day by saying “From 9 to 9:30, I’ll do X, then from 9:30 to 10:00 I’ll do Y” and so on. I end up being way more productive and don’t feel as overwhelmed. Unless I’m looking to join in with groups or do longer content (say, dungeons), this applies terrifically to the MMO juggler. Most nights I give each MMO under my wing a half-hour (sometimes a little more) of play before rotating to the next one, and it’s actually been a lot of fun. Okay, sure, I don’t make huge amounts of progress in any one game in an evening, but a half-hour is a few quests at least — and those add up over the span of a week. In Star Trek Online, it’s a good story mission. In LOTRO, it’s a quest hub. In SWTOR, it’s the next leg of my character story. In Fallen Earth, it’s some crafting and exploration. I guess it comes down to the drive to get to the endgame versus appreciating the journey and being okay with taking one’s time walking the road. Sure, sometimes it’s a little jarring to shift every half-hour or so to a different game, especially if I was really getting into my groove, but I adapt quickly enough. It’s also helpful to take notes on what goals I’m actively working towards in each game so that I don’t have to spend the first ten minutes trying to remember what I was doing last time and what I need to do now. Not every night is divided up like this, either. Sometimes I give myself permission just to focus on a single game if I’m feeling the urge to do so. But more often than not, the revolving method comes into play, and it sort of feels more natural to do so — it’s how I used to play console games, swapping cartridges every so often during longer sessions. Time should bow to the player, not the other way around, right? “Simply put, Trion decided to scale back their original vision so that they could keep the standard MMO trappings that we have all known since WoW reared its head back in 2004. In short, they took the Half Measure. Face it: Plans change. As a gamer, it’s good to be flexible even if you’re an obsessive planner (like I am), and last week I came to the realization that I utterly disliked my Jedi Consular in SWTOR. I had a great grand plan about playing all eight classes, but midway into Coruscant, I just wasn’t feeling it AT ALL with this dull-voiced, dull-personality twit who is part of an order that I openly mock on street corners to anyone willing to listen. Jedi, schmedi — take your dandelion fluff balls of force and get a real job. So I trusted my gut and got out of that abusive relationship. I asked myself if I was just going to do one Republic character, ever, which one would I want to do to make sure I did it? And does that sentence even make sense? I’ve been horribly sick this past weekend, so I could just be typing on a banana right now, I don’t know. But the answer was “Smuggler,” even though that is the counterpart of the Imperial Agent. Gut said “Go!” and reroll I did. Agent counterpart as it is, I was still like “oh yeahhhhh” when I started to play it. It just fit me so much better than the Consular. I love the attitude, the semi-selfish/semi-heart of gold personality, the fact that I’m outside of any military/pseudo-military organization, and blasters are just way more fun than lightsabers. Plus, I got a blaster named “Flashy,” and that tickles me to no end. I know the Smugglers are pretty darn popular, way more so than the Agents, but that’s fine. They’re the blatant appeal to the Han Solo/Malcolm Reynolds/antihero escapist fantasies we admire in film and on TV, but that’s fine as well. I’m going Gunslinger to try more of a DPS spec after my Operative’s healing spec, even though that goes counter to my hybrid-loving nature. I kind of really like her: Captain Thursday has freckles, can be sassy all day long if the job requires it, and I get to run around with twin blasters going PEWPEWPEW like I’m seven years old playing G.I. Joe with friends in the backyard. I’ve heard from others that Corso Riggs — your first companion — is a much-maligned character, but I’m kind of digging his Good ‘Ol Boy demeanor. Plus, I chose a different head for him so that he didn’t look like he had held up a dreadlocks bank earlier that day. I feel a lot more laid back leveling this time around, even though I really do want to get through the character story (in fact, I wouldn’t even mind a version of the game where that’s all you could do, especially for subsequent alts). I know there’s some curiosity about the patch in March, with a lot of hopes that it will add some much-needed content and fixes across the board. After experiencing Trion’s model last year, BioWare’s approach feels downright sluggish, with only one raid-centric patch released since launch. You’d think with so many people working on this project that there would’ve been a lot more movement by now, but I guess there are other, more pressing concerns. Starflight was a game that was almost impossible for me to play, even though I loved it. Let me explain. One of the reasons I know I’m getting old is that I’m starting to say things like “Kids today didn’t know how it was when [archaic technology] was around,” which wins friends in all sorts of circles. But the truth really is that most younger computer users today really have no idea how fickle and tricky PCs in the 80s and even early 90s could be. They weren’t like consoles with games, where you just plugged in a cartridge and went at it; each title had requirements that, depending on your rig, could make it completely unplayable on your machine. I know it’s like that now, but it certainly doesn’t seem as severe an issue as it was back then. Computers were expensive, upgrading them was expensive, and just to get some of these programs to work required manually fiddling around with Autoexec.bat and Config.sys files (I even had a load screen menu created that would allow me to swap between them). Starflight was brutal to run on our family’s aging computer, because we really were at the minimum required stats AND we had no hard drive. This was an issue because, for whatever reason, Starflight didn’t have a friendly save-and-reload game system — that sucka was permadeath, all the way. If you lost a game, you’d have to start over (or turn off the computer and reboot, hoping that it wasn’t saved at that point). And because of the no hard drive situation, each new game required a set of copied floppy discs, since you really wouldn’t want to play on the originals, lose, and then never be able to play it again. Add to that an obtuse copy protection wheel chart, and the whole game was a hassle from start to end. And yet I loved it, because it really was the closest I could get to living out my Star Trek fantasies in video games at the time. The premise was simple: You started out with some cash to equip a spaceship, you made up a crew compliment, and you went out into the stars for fame, fortune, and (in my case) gas. I’ve heard there was a story somewhere, but I barely even knew what I was doing, so my main goal was to head to a nearby star system and mine for valuable minerals to haul back for meager upgrades and lots more fuel. Sometimes I’d encounter an alien ship and then pee my pants because I’d get creamed, but it was an invigorating experience even so. I’m recalling Starflight now because my recent adventures in STO have reminded me how attached I got to my crew and the concept of decking out a ship. But unlike STO, outer space in Starflight was a truly daunting experience full of instant death at every turn. I got so excited when they announced a sequel, but I think at the time I hadn’t purchase my own computer and the specs were way too high for our old one, so oh well. Such is the life of a galactic captain.